Our NEW 81 page Industrial Hose Catelogue is jam packed with great deals - Order yours today! To get a hardcopy add the code "INDHOSECAT" to your basket upon checkout or download a PDF copy right now (click 'More info' button). 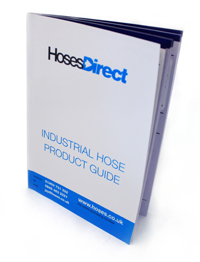 At Hoses Direct we have a wide range of industrial hoses and couplings, including PVC hoses, rubber hoses, compressor hose assemblies, diesel delivery hoses, non-toxic hoses, Brewers Hoses, steam hoses, braided hoses, silicone hoses, dairy hoses, marine fuel hoses, chemical XLPE & UHMWPE Hoses, fire hoses, sandblast hoses, all available to buy online, from a UK Supplier at low, low prices.